Around the world, women are targeted by violence because of their commitment to vote, their jobs as electoral officials and their aspirations to hold political office. NDI categorizes this kind of violence as “violence against women in elections” (VAW-E), and defines it as any act of violence -- threats, hate speech, assault, blackmail or assassination -- that is unduly directed at someone because of her gender, and that seeks to determine, delay or otherwise influence her engagement in an electoral process. VAW-E can take many forms and occur throughout the electoral cycle, from pre-election through election day and the post-election period. One particularly gruesome example is that of a woman mayoral candidate in Mexico who was decapitated just a few weeks after beginning her campaign. In Pakistan, women were barred from voting by traditional councils and by armed men at the polling booths. Following the 2012 elections in Libya, one woman elected to her local council with more votes than any of her male peers was denied the presidency of the council due to male opposition to her leadership. In the 2008 election cycle in Guinea, dozens of women were raped when military forces broke up a pro-election political rally in Conakry. Election-related violence against women is a separate issue from general electoral violence because it is specifically aimed at preventing women from exercising their voice and agency. Women are targeted specifically because they are women, as opposed to the election violence that stems from differences in candidates’ or parties’ positions on issues. However, it has not been tracked or measured separately from general violence during elections — a major concern, for as long as the majority of data on electoral violence remains gender-blind, it is impossible to properly address the problem and bridge the gender gap in political participation. This has implications for the integrity of the electoral process and, ultimately, undermines democracy. What is NDI doing about it? 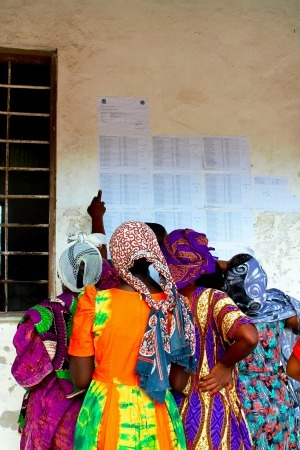 To address the issue of violence against women in elections, NDI developed an innovative methodology to strengthen the capacity of election observers to monitor and mitigate VAW-E and to promote a deeper understanding of the phenomenon worldwide. Through the “Votes Without Violence” initiative, NDI has collaborated with civil society groups observing elections to pilot the methodology in Guatemala, Nigeria, Burma, Tanzania and Côte d’Ivoire to improve the way VAW-E is tracked and prevented, and continues to work with groups around the world to raise awareness and increase the amount of data on the issue. NDI’s Votes Without Violence toolkit, launched in autumn 2016, provides detailed guidance for citizen observers, and is also a valuable resource for any NDI elections support program, including those involving international observer missions. The dedicated Votes Without Violence website presents visualized data that is collected in each country and observation about VAW-E, providing a central public platform to illustrate trends over time, raise awareness and serve as a global resource about the phenomenon. Check out the following stories for more information about the “Votes Without Violence” campaign, and join us to raise awareness about the issue on Twitter using the #VotesWithoutViolence hashtag.